If you want to go on the trip of a lifetime, then go see the rainforest with all the different animals that live in the rainforest. You will see animals that you didn’t even know existence and you see how the rainforest is alive and breathing. The animals that are in the rainforest help the trees keep alive with doing different things for the trees and over half of the world animals live in one type of rainforest that are spread over the whole world. 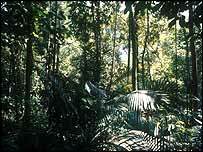 Some of the common animals that live here are snakes, apes, monkeys, gorilla, spiders, frogs, and lizards. There are four levels of the rainforest and they are emergent layer which is where the tree are over two hundred feet in height, the canopy which is the level of one hundred feet to one hundred and fifty feet above the floor of the rainforest, the understory of the levels which are mostly insect living at this level because of the humid temperature which are reached here, and the rainforest floor which only gets one to two percent of the sunlight that hits the upper layers of the rainforest. Going on a trip to the rainforest would be an experience of a lifetime which you could back pictures of the animals that live there and the unbelievable sights that you will see. Get started now on a trip of a lifetime.